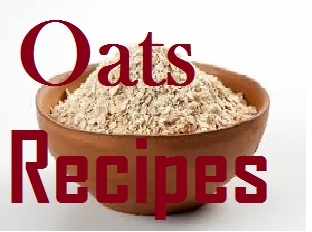 What has brought you to this page is your search for a healthy breakfast option, right? Or you might be looking for a healthy snack idea for preschoolers or elders alike. When health tops the list of your priorities, can taste be left behind? Of course, you are often constrained for time when it comes to making healthy snacks. But not once you learn this one pot one shot vermicelli recipe. This instant OPOS vermicelli pulav biryani recipe takes inspiration from Jyothi Cooking Book. If I dub OPOS as culinary magic, I won't be wrong. OPOS practitioners and students love one pot one shot technique for its sheer role in helping give you healthy, instant, and nutritious food, irrespective of your ethnic cuisine type. 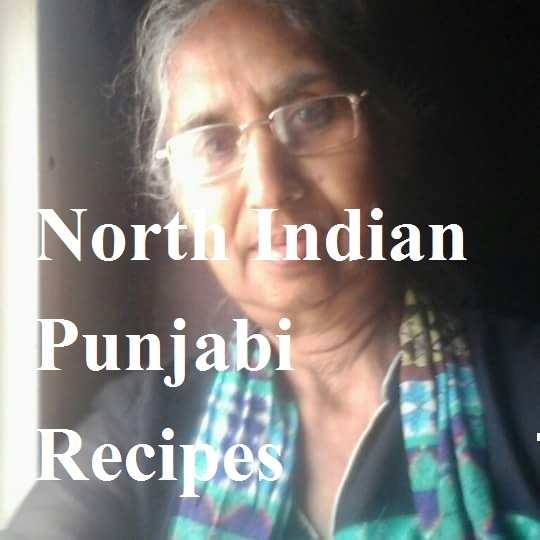 Whether you are a Punjabi, Bihari, Bengali, Madrasi, Malayali, Odiya, or from any part of the country (can't say about Western cuisine), you will fall for this technique if you give it a try once. 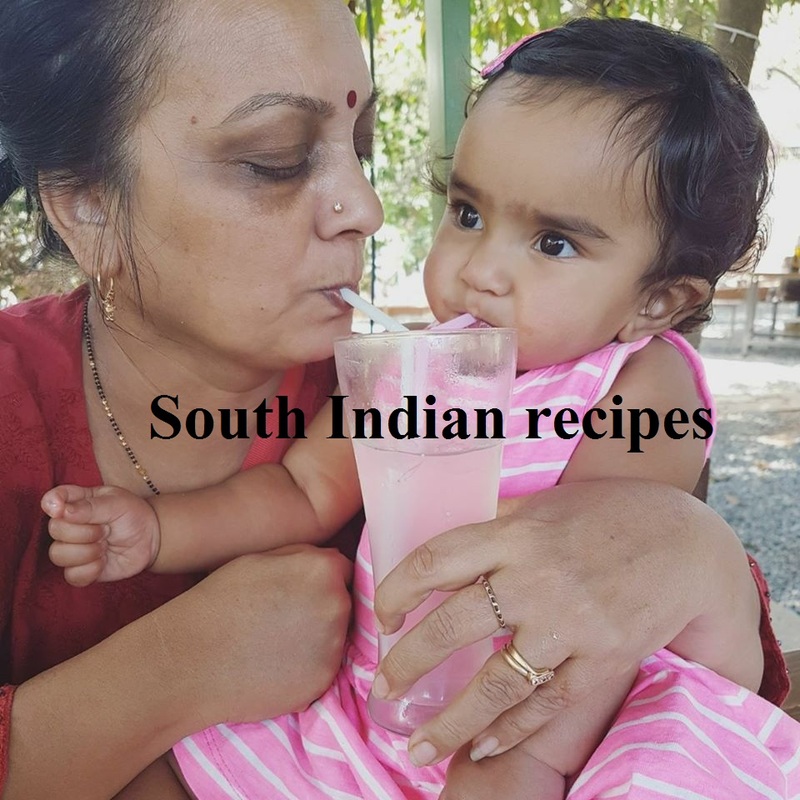 Okay, I do not want to hijack this post by giving you a lecture on OPOS, a culinary technique, which is the brainchild of Mr. Rama Krishnan. Think of instant food, and 2-minute maggi will flash your mind in an instant. But there is more to instant food than instant maggi. What if we give you a no-fail recipe for instant biryani vermicelli that is more of a visual treat and tastes just like your favorite maggi. But our instant vermicelli upma or biryani has the advantage of being a healthy snack option, which is made with whole wheat semolina. I do not eat noodles. Rather, hubby and I left eating noodles a few years back, when we came to know about their dark side. Then we decided to substitute noodles with wheat, suji, ragi vermicelli. I must tell you these little noodles taste as good as noodles, and the best part being these aren't wax coated like the latter. 1. Dry roast vermicelli. Keep aside. Chop potatoes into small pieces and marinate them with little salt, sugar, and turmeric. 2. Take a 2 or 3-liter pressure cooker. 3. Add 3 tsp water and 1 tsp oil. 4. Layer sliced onion on top of the oil-water layer. 5. Add green chilly if you want. 6. Layer chopped, marinated potatoes(do not make them too big- smaller the better), carrot, peas. Also, layer boiled chickpeas or green peas or any other vegetables of your choice. Spread vermicelli as a layer on top of it. 7. Layer garlic ginger paste on top of it. 8. Sprinkle salt, turmeric, and garam masala. DO NOT MIX. 9. Add water without disturbing the layers. 10. Cover with lid and weight (whistle). 11. Cook on a high flame for 2 whistles. 12. Release pressure. Mix everything gently, ensuring the masala coats the vermicelli well. Cover for 5 minutes and enjoy instant vermicelli upma or OPOS pulav with vermicelli. 13. This is going to be the yummiest vermicelli pulav ever that you have tasted. You can trsut my word for it. The OPOS vermicelli recipe gives you non-sticky vermicelli upma. What more do you need? If you wish, you may still sprinkle little oil on top of the vermicelli before closing the lid and pressure cooking. 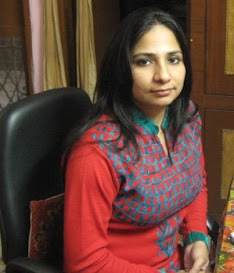 Earlier, I had shared vermicelli chilli noodles recipe. This time I have taken inspiration from a friend Sangeeta Chandra's vermicelli upma recipe to come up with my vermicelli (sevai) pulav recipe. It's hit in my home. 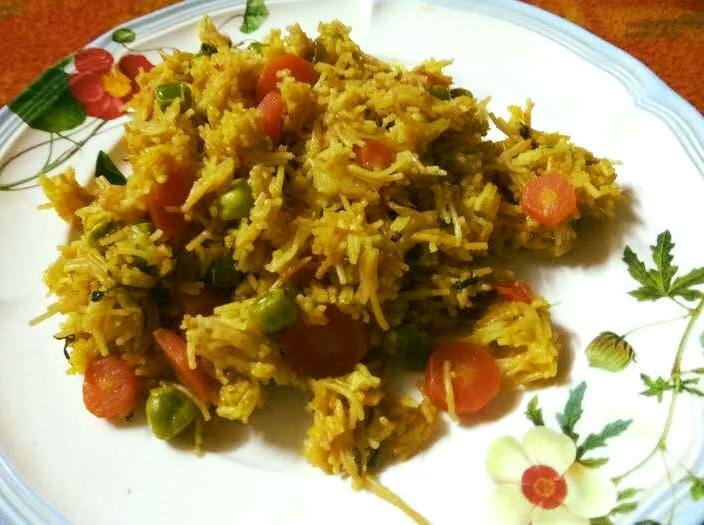 Here I am sharing two ways to make vermicelli pulav. The newest method gives you tasty, tangy pulav. 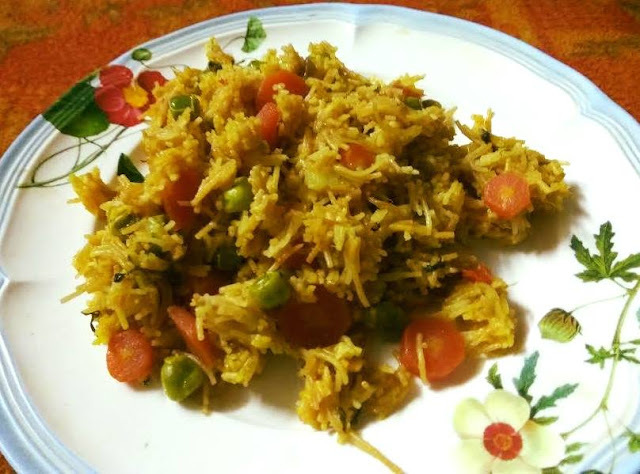 Do give this chatpati vermicelli pulav recipe a try. I have followed one pot one shot OPOS method of Rama Krishnan.I am glad I found this method. It has made life easier for me. Put oil in a 2-or 3- liter pressure cooker. Add onion and ginger garlic paste. Close the lid and put on the flame. Wait for 1 whistle or 5 mts. Immediately turn off the flame. Meanwhile, chop vegetables of your choice and marinate them with curd, salt, turmeric, garam masala/sambar powder, sugar, coriander powder. Alternatively, dry roast vermicelli and then wash it in hot water and immediately give it a cold bath. Keep it on a strainer so that it does not get sticky. Open the pressure cooker, add 1 tbsp water and marinated vegetables evenly. Leave some space in between so that the steam can rise up. Pour vermicelli over the vegetables. Next add a layer of coriander leaves. Add salt and 1 tsp oil and cover the cooker lid. Wait for either 1 whistle or 5 minutes, whichever is earlier. Just turn off the flame and release pressure. Sprinkle lime juice and pinch of sugar and mix everything well. 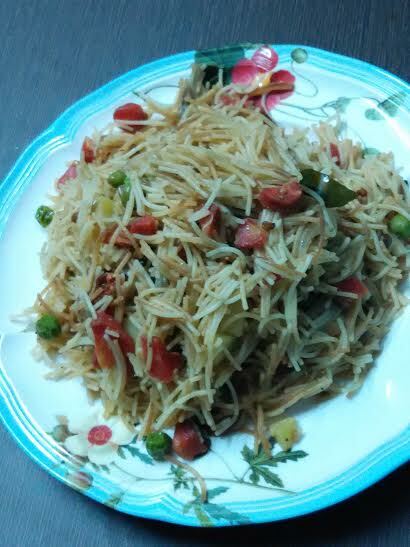 Enjoy chatpatta vermicelli pulav without any chutney. 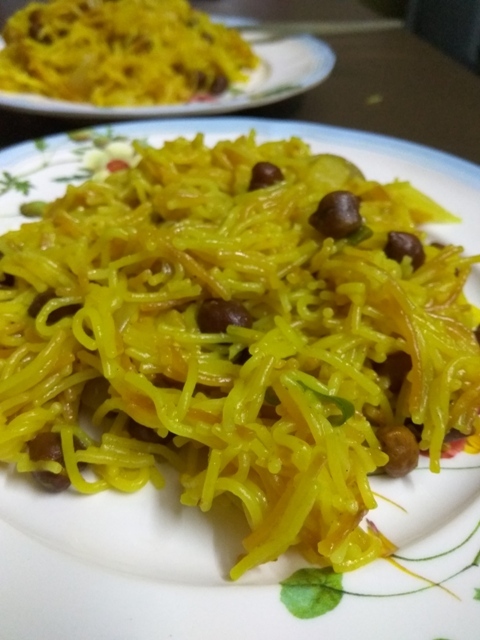 Below is my old method of making vermicelli pulav, but I find the OPOS method of making pulav tastier, yummier, and easier! What about you? Dry roast vermicelli. Let it cool. Then take 2 cups of water and add vermicelli to it. Keep it for boiling. Let it boil for 8-10 minutes. Drain, strain under cold water and keep aside on a sieve so that the water dries up. I steamed carrots, potato, tomato, and peas. You may choose to steam the veggies or fry them. I chose to steam them since it saved me oil and time. Add chana dal, urad dal, mustard seeds. Let them splutter. Add curry leaves and stir. Cook & then add grated ginger & green chilly. Add salt and coriander powder. Next add the steamed veggies. If you have not steamed them, you can fry them here. Once the veggies are done, add boiled vermicelli. Mix well. Keep stirring for 2-3 minutes until the veggies and vermicelli have fused together. You may sprinkle lemon juice over the vermicelli. 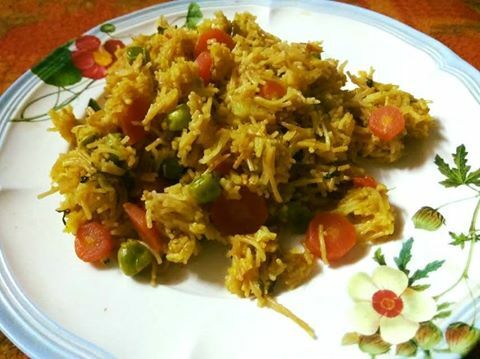 Enjoy your early morning breakfast with this health friendly tangy vermicelli pulav. Healthy breakfast option ..thanks for the share Ravneet. Glad, you liked it, Poonam. Thanks for stopping by!